Resume Builder provides professional resume writing service in the twin cities of Hyderabad and Secunderabad. Discover how Resume Builder is helping professionals with personalized resumes move up in their careers. Our services are backed by our team of professional resume writers having expertise in drafting winning resume for your unique requirement. Resume Builder is iSource Services' premium professional resume writing and resume development service. Resume Builder offers iSource Services' unique recruiting insights to every resume writing assignment with a single minded focus on quality and sense of purpose. ► Privacy Guaranteed: You will never find our reference in your resume, ever. We take your privacy as seriously as you do. ► Free Telephonic appointment with resume analysts to discuss your past accomplishments and career goals. ► Unlimited telephone and e-mail support. ► Free revisions post delivery of final resume. 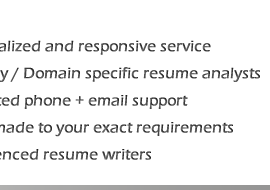 ► Resume writers with extensive industry / domain experience. ► Fast and responsive processes. ► Faster turn around time of 5-7 days for final resume. ► Resume developed in .Doc, .Docx and .Pdf formats. Suitable for young executives and Freshers, who have just stepped into a professional arena. For professionals who have embarked their journey towards a successful career looking for more focussed approach. For middle level executives seeking to define their leadership qualities in their career. For Seasoned Executives looking for a Resume which can project their experience and capabilities. For Senior Executive who are well set and looking for a career jump. For Executive aiming for the top slot in their careers. Leadership resume for senior level and C-suite professionals and aspirants. Tailor made resumes with class leading content and international level professional output. Benchmark against the best in the industry and validate your candidature with the industry's best practices. Every resume undergoes a comprehensive review by our expert review team. Every resume is meticulously reviewed on various parameters such as : Spelling and Sentence Formation , Core Content , Layout and Styling, Accessibility, Presentation and Relevance. Our expert resume writing professionals makes sure that every minute detail is covered. Every resume goes through complete manual editing. No automated programs or macros for us. We believe every resume is unique and it deserves same amount of effort and respect. Our professionals have thousands of man-hours of experience and we being a recruitment firm, understand your requirements better. We make sure we are in touch with you through phone / e-mail when we rewrite and redesign your resume. We believe in live input and make it a point to know what exactly you want. iSource Services' endeavour has been to create value to your resume through our expertise in resume development. Fill the online form to order Resume Builder; choose the appropriate options and your total professional experience and Submit. You will receive the e-mail confirmation of the submission of your resume. Make payment for Resume Builder as per the appropriate experience ( list of charges ) , you can find the Bank Account details here . If you want your resume within 48 hours pay as per Express Resume charges. iSource Services will email you the payment receipt and initiate the resume writing service. Our Resume Builder analyst will get in touch with you for further resume writing process and to ascertain your exact requirements..
Email us : resumebuilder@isourcecorp.com Call: +91-7755901241 to get in touch with us, 10 AM to 8 PM IST. *(Online Bank Transfer accepted from all Banks). *Please note to avail this service you must make the payment up front. » Cash payment from all banks accepted using NEFT form. Please visit your nearest banks and ask for NEFT form, fill in the details and pay in your local bank. You can Deposit Cash directly to our IDBI Bank Account from anywhere in India. You can visit any local IDBI Branch and directly credit the amount into our Account. For details regarding our IDBI Bank A/C please call us on 07755901241 or mail us on resumebuilder@isourcecorp.com . Additionally you can pay in cash by visiting any nearest bank and pay us by filling the NEFT form. Fill in all the details as mentioned above and submit the NEFT form. Please retain the counterfoil as a proof of payment and email us the scan/pic of the same to resumebuilder@isourcecorp.com . Terms of Service: By using this service you agree to the following. 1) This is a prepaid services i.e. payment must be made up front before we can service your request. This service is non- refundable. 2) The introductory price is valid for a resume not exceeding 4 pages(A4) and every extra page (A4) shall attract additional charges to be intimated to the client, iSource Services has the discretion to waive off the amount if it so decides. 3) iSource Services reserves the right to make changes/withdraw this offer at any-time it deems fit. 4) iSource Services is not bound to serve every requisition to for this service, iSource Services reserves the right to deny this service at its discretion to any individual/s without assigning any reason/s. Incase payment has been made, iSource Services will refund the amount. 5) The introductory price is likely to be changed as per the discretion of iSource Services without prior intimation. 6) iSource Services does not give any assurance or warranty or guarantee about you securing a job by availing this service, this is a purely resume development service and does not guarantee any job. 7) iSource Services does not take responsibility of any damage caused by the usage of this service. Our maximum liability is limited only to the refund of the amount received by us. 8) If cash is deposited in our bank account, any charges arising out of cash deposit will have to be borne by the applicant of this service. We will not initiate the resume development work till full payment has been made. 9) Resume development/writing shall only start once payment has been realized in our bank account. 10) iSource Services reserves the right to a delay in delivery owing to exegencies or factors that are beyond our control. By availing for Resume Builder the user is making sure that iSource Services will not be held liable for reasons beyond the control of iSource Services. 11) In case the service has not been delivered within 30 days after the payment has been made in full by the applicant, iSource Services will refund the original amount to the applicant. 13) **Turn Around Time for Express Resume is 48 hours after receiving the Draft 1(requirement gathering process). Cut-off time for receipt is 5 p.m. beyond which requisition received will be treated on the next working day starting at 10a.m.. For Requisitions received on weekends the next working day starting at 10 a.m. will be considered as the starting time. 14) Working days Monday to Friday 10 a.m. to 6:30 p.m. , Saturdays 10 a.m. to 2:30 p.m. , Sundays and Public holidays are off. • Please retain your bank counterfoil if you pay cash in the bank. • If you pay using online banking, please note down the transaction id. or take the screen shot of the payment confirmation transaction. Read what users of Resume Builder have to say about our service. "... your effort shows in every line and every paragraph. I liked your approach and responsiveness. Thanks for your hard work... "
" Your service was great. The best part of it was it was hassle free. The work on the CV looks quite impressive to me and i would really like to thank you for this. I am surely going to recommend your services to my friends and others who require some assistance with their resume. Thanks. .. ."A. Agarwal , Area Sales Manager, Leading FMCG Co. "..Thanks for the superb effort. I liked your exhaustive approach. I have referred one of my very senior colleague who would shortly contact you for his CV development. Keep up the great work....."
A. Mehrotra , Director, leading interior design firm. ".... I liked your thorough professional review and keen editing. Thanks for the great job, appreciated...."
A.V. Kulkarni , Delivery Head ,one of Top IT Co, in India. For general enquiries mail us on info@isourcecorp.com, Call us on 07755901241 (10 am to 6 pm IST, monday - friday).